A bullet hell clicker. 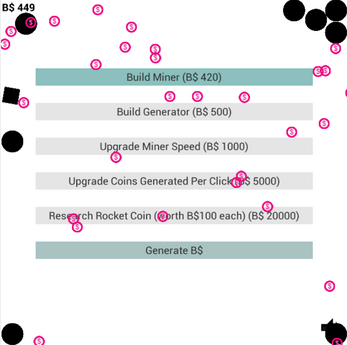 Mine BulletCoins (TM) with a click, but be careful of where your mouse cursor goes, and avoid anything that's pink! Tip: You can drag the miners and generators around. Made for the Ludum Dare 40 with the theme "The more you have, the worse it is"
Didn't have much time to jam this time round, but with the little time I had, I banged together this entry just to be in. All in all, less than 8 hours? Hope its still entertaining enough though. Post your high scores below! This idea is so clever to me. I like how this ties so well into the theme and expands on the clicker genre, and ingeniously breaks the 4th wall! Heh someone's been playing this for a while! Good job! Thanks for playing and feedback, added a mute button! Yeah a little basic at the moment, added a new research option but it's pretty barebones. Thanks for clicking!